Protesters hold signs against Myanmar leader Aung San Suu Kyi and the killing of the Rohingya people during a rally for Rohingya Genocide Remembrance Day on Parliament Hill in Ottawa on Aug. 25, 2018. 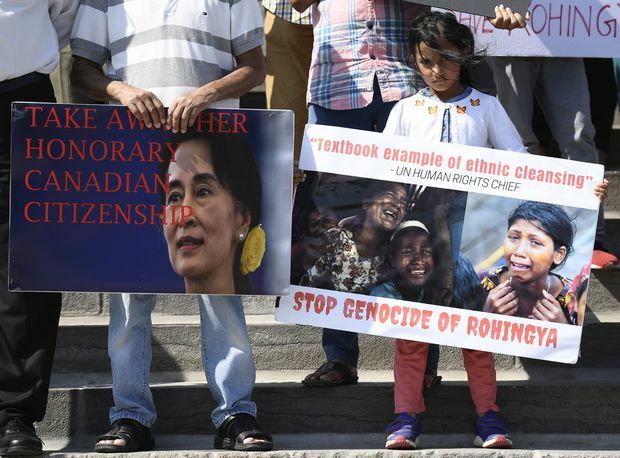 Two more former Liberal cabinet ministers have joined calls for the federal government to strip Myanmar’s embattled de facto leader, Aung San Suu Kyi, of her honorary Canadian citizenship, despite concerns the move could harm Canada’s efforts to help resolve the Rohingya crisis. Lloyd Axworthy and Allan Rock said it is time for the Liberal government to revoke Ms. Suu Kyi’s honour amid mounting international criticism of her handling of the Rohingya crisis. Their comments come days after a scathing United Nations report faulted Ms. Suu Kyi for failing to use her “moral authority” to prevent the violence that has forced nearly 725,000 Rohingya, an ethnic minority in Myanmar, to flee to neighbouring Bangladesh. They join Irwin Cotler, a former justice minister and renowned international human-rights lawyer, in arguing for the revocation of Ms. Suu Kyi’s honorary citizenship, which was awarded for her efforts to promote peace and democracy in Myanmar. Mr. Cotler said Tuesday that Ms. Suu Kyi “does not belong in that pantheon of heroes,” which includes fellow Nobel Peace Prize laureates Nelson Mandela, Malala Yousafzai and the Dalai Lama. A senior government official, who was not authorized to speak publicly, said the revocation of Ms. Suu Kyi’s honorary citizenship would not help diplomatic efforts to resolve the crisis or the well-being of Rohingya refugees. The Conservatives and the NDP did not respond to repeated requests for comment about their positions on Ms. Suu Kyi’s honorary citizenship. Mr. Rock served as an MP for more than a decade under former prime minister Jean Chrétien’s Liberal government, before being appointed Canada’s ambassador to the UN. He said that if given the opportunity today, he would vote in favour of revoking Ms. Suu Kyi’s honorary citizenship. Mr. Axworthy, who oversaw the foreign affairs file under Mr. Chrétien, said a decision to revoke Ms. Suu Kyi’s honorary citizenship should be part of a broader diplomatic effort by the Canadian government to hold those responsible for the Rohingya crisis to account. “There is no question in my mind that her honorary status should be revoked. She has done nothing as civilian head of government to counter the military oppression of Royhinga people,” Mr. Axworthy said in an e-mail on Wednesday. Amnesty International Canada also said it is time for the government to rethink whether Ms. Suu Kyi’s honorary citizenship can be leveraged to increase pressure on her or whether it’s time to revoke it altogether. While there is no precedent for revoking the honour, the procedure would be the same as awarding it. In 2007, the House of Commons unanimously passed a motion, tabled by then-prime minister Stephen Harper, to grant Ms. Suu Kyi honorary citizenship. That means the honour would have to be revoked through a similar motion tabled by an MP. With the world awaiting Ms. Suu Kyi's response, she has remained silent on the allegations made in the UN report Monday. Ms. Suu Kyi has already been stripped of other honours around the world. Earlier this month, the Canadian Museum for Human Rights in Winnipeg removed a reference to Ms. Suu Kyi in one of its exhibits. But she has also maintained one of her most notable awards: the Nobel Peace Prize. The Norwegian Nobel Committee said on Wednesday that it will not withdraw her prize in light of the recent UN report because the rules do not allow for it. Peter MacKay, who served in Mr. Harper’s cabinet, said that while revocation of Ms. Suu Kyi’s honour may be appropriate, it might not have much effect in practical terms. Ms. Suu Kyi does not have any control over the military, which has been accused of leading the attacks on the Rohingya in Myanmar’s Rakhine State, under the country’s constitution. “Symbolism can be important and can convey a message and even sway opinion, but it won’t, in this case, help starving, ill [and] displaced Rohingyas," Mr. MacKay said in an e-mail. There’s also a camp of experts who reject the calls to revoke Ms. Suu Kyi’s honorary citizenship, including Canada’s former ambassador to Thailand, Andrew McAlister, who simultaneously served as envoy to Myanmar from 2002 to 2004. Bryon Wilfert, a former Liberal MP who now serves as Myanmar's honorary consul to Canada, said the honorary citizenship question is “a bit of a distraction.” He said Canada should focus on continuing to support democracy-building efforts in Myanmar if it wants to make a real difference in the country. The federal government announced in May a commitment of $300-million over three years to help respond to the Rohingya refugee crisis and fund efforts to hold perpetrators of human-rights violations against the ethnic minority to account.